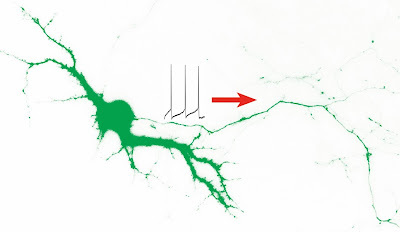 Scientists have discovered how sodium ion channels travel from the neuron to the axon to initiate central nervous communications to and from the brain. They observed that two proteins, Ankyrin-G and Kinesin-1, play an important role in the process. The ankyrin-G protein tethers the sodium ion channel to the axon while kinesin-1 transports it to the axon. This process is fundamental in moving nerve signals along the central nervous system. These nerve signals, carried by the sodium ion channel, cover information like sense (touch, feel, taste, etc), movement, memory, and thinking. These signals, which are electrical and chemical in nature, do not fire up all at once, it jumps from axon to axon. The image of a neuron above shows how the nerve impulse travels along the axon which is the long, slender extension of the nerve cell body. Scientists have long wondered how the mechanics of the movement of the sodium ion channels, the protein responsible for the signals, from the neuron to axon works. These proteins have to be delivered to the axon or else nothing happens. There are about 80 to 100 billion neurons in the human brain. These are interconnected to each other through synapses in which there are about 100 trillion. The neural network transmits information through electrical and chemical signals. Scientists have solved a longstanding mystery of the central nervous system, showing how a key protein gets to the right spot to launch electrical impulses that enable communication of nerve signals to and from the brain. Nerve impulses are critical because they are required for neurons to send information about senses, movement, thinking and feeling to other cell types in the neural circuitry. And an impulse is not fired up just once; it is initiated and then must be repeatedly transmitted along axons – long, slender extensions of nerve cell bodies – to keep the nervous system's messages stable during their rapid travel. The research could help explain the deepest origins of many neurological disorders – ranging from multiple sclerosis and Parkinson's disease to injuries of the spinal cord and brain – that are traced to malfunctioning or degenerated axons and the resulting improper electrical signaling. "Mutations in the genes encoding the three proteins can lead to some neurological and mental disorders in humans. In many other diseases, the primary defect initiated by something else can alter the function of these three proteins – and particularly sodium channel transport and function – and ultimately disrupt the nerve impulse," he said. "If the sodium channel can't conduct the nerve impulse anymore, that gives rise to symptoms of neurological disorders."